What's more fun than a penguin wearing a hat? These cards can be used to practice letter identification, letter sounds and upper and lower case matching. 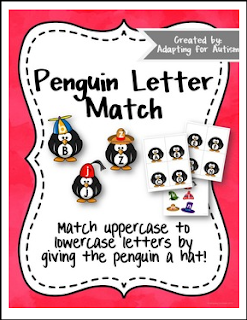 This packet includes 26 cards with uppercase letters on the penguins' bellies and 26 hats with the lowercase letters. Students match up the letters to give the penguins a hat. Check out some other penguin resources including my adapted book Penguins in Disguise and Penguin File Folder Activities.